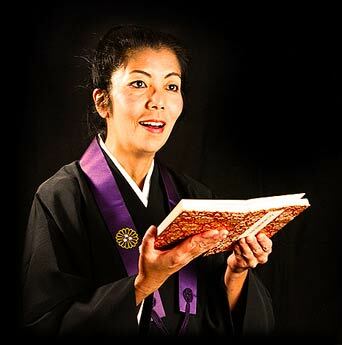 November 14, 2014, 18:30: Gion-Shoja Biwa Singing Workshop at Kôfuku-ji Temple, Nagasaki, Japan. 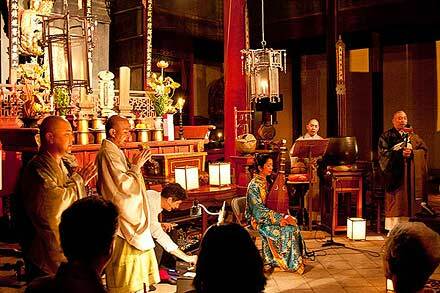 November 15, 2014, 18:00: Duo Ueda Offermans Concert at Kôfuku-ji Temple, Nagasaki, Japan. The program includes: Tsuru-no-Sugomori; Shunkan; Heike Duo and Ingen's Dream (with shomyo Buddhist chanting of Obaku-shu monks). Ingen's Dream is their special composition, dedicated for Ingen's (Chinese founder of Obaku-shu Buddhist sect) arrival in Japan 360 years anniversary. December 11, 2014, 18:30 ~ 21:30: Shomyo Workshop at Ateliers d'ethnomusicologie, Geneva, Swiss. February 26, 2015, 18:15 ~ 19:00 beginners / 19:00 ~ 21:30 all together: Shomyo Workshop at Ateliers d'ethnomusicologie, Geneva, Swiss. March 28, 2015, 22:00: Festival Electr()cution, Brest, France. Ueda will perform "Erkos" and "Galaxies", compositions by French composer Jean-Claude Eloy for biwa/voice and live-electronics. 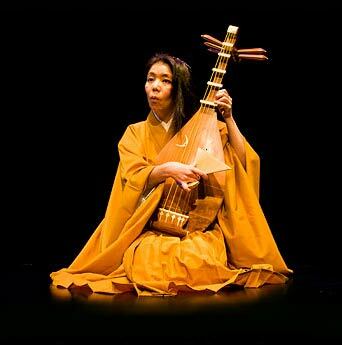 April 5, 2014, 21:00: Duo Ueda Offermans at Teatro Alhambra, Granada, Spain. La Semana de Japón organized by University of Granada. April 29, 2014, 19:30: Shomyo workshop / Biwa demonstration at Conservatory Superior of Granada. May 30, 2014, 21:00: Solo recital in Yourte Parc Bernasconi Petit Lancy, Geneve, Swiss. Festival Poussière du Monde organized by ADEM. June 16, 2014: Duo Ueda Offermans at University of Örebro, Sweden. June 16, 2014: Shomyo Buddhist chanting workshop at University of Örebro, Sweden. August 7, 2014, 20:30: Duo Ueda Offermans at Conservatoire de Musique, Nice, France. The concert series "Melting Point" at Académie Internationale d'Eté de Nice.